A shooting incident at 14th and U streets in Northwest. 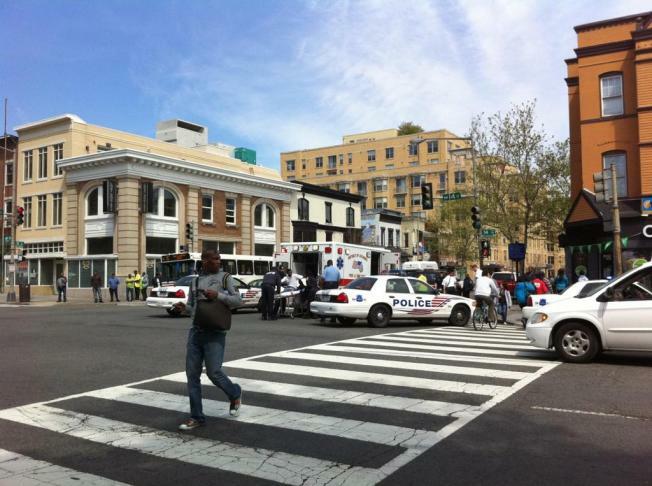 The area of 14th and U streets in northwest D.C. has been closed because of a double shooting. D.C. Fire and EMS confirmed the shooting Thursday afternoon. An ANC commissioner told Tom Sherwood that the shooting took place at 14th and V streets. The victims wound up at 14th and U streets looking for help. A woman who lives in an apartment above the Busboys & Poets restaurant on 14th Street said she was having lunch when a bullet went through her window. Two male victims were taken to an area hospital with non-life-threatening injuries. U Street was closed between 13th and 14th streets, and 14th Street was closed from U Street to W Street, but both streets had reopened by 5 p.m.
Stay with NBC Washington for updates as they become available.